The PSRR is an important quality indicator for power supplies. It can be easily measured with the Bode 100 and the Picotest J2120A Line Injector. This Application Note shows how. R&D engineers for power supplies are often challenged to measure Power Supply Rejection Ratio or Power Supply Ripple Rejection (PSRR). The PSRR is a very important parameter for power stability. It provides information on the influence of input voltage variations on the stability of the output voltage. Measuring PSRR requires a high dynamic range of the measurement equipment. Therefore it was so far quite seldom measured. The Bode 100 and the Picotes J2120A Line Injector enable a simple, reproducible and exact measurement of the PSRR. Good power supplies can reach a supply voltage ripple rejection of more than -100 dB. In our application note we describe step-by-step how you can easily measure the PSRR in your lab environment. 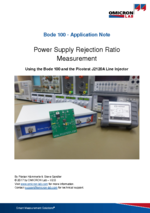 Besides the correct setup of the Bode 100 it is shown how the output capacitor influences the PSRR and power stability.